Given my love of subscription boxes, it’s no surprise that I’ve found a box for my new hobby. I’m not a massive fan of many of the designs in cross stitching magazines and didn’t want to spend a fortune on Etsy patterns. Therefore, I started looking up subscription boxes that could send me some new designs each month. 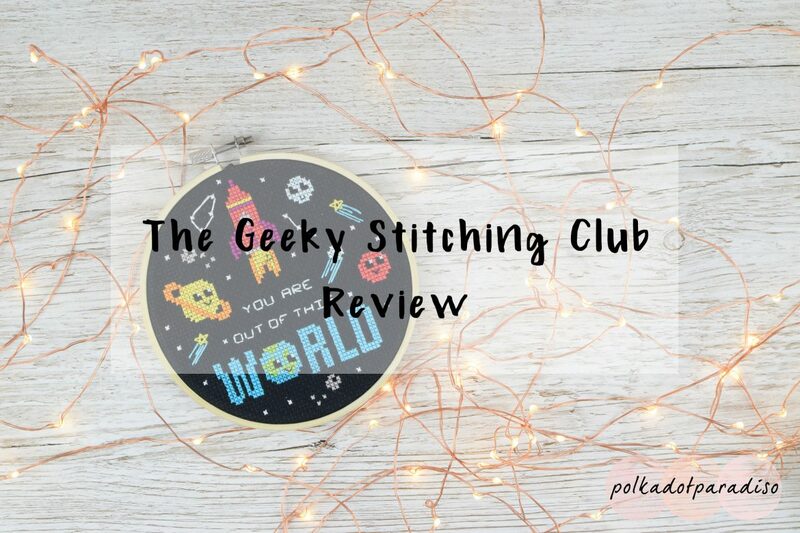 I happened upon The Geeky Stitching Club and fell in love with the designs on offer! To begin with, I ordered a one off box for £13.49 so I could take a look at the kit contents and see whether it was for me. The first thing to note with this subscription is how great the packaging is. It comes in a little pink box that fits nicely through the letterbox, along with some nice branding and a personalised sticker. This continues throughout the box with your goodies wrapped up in pink tissue paper and sprinkled with confetti. The instructions and all the materials that come with kits are really easy to follow. Creating the main kit from this box (the one with the black aida) was super straightforward to do. It was also my favourite design out of the three in the box. The added extra supplies are a really nice touch and for someone just starting back with cross stitch it’s really handy to build up my stash with. The main design from this was so lovely I finished it in just a few days! I really loved making this kit. The design is super cute and I was getting so excited as I completed different bits. The only issue I had making it was I ran out of white thread. Because the white stars are dotted all over you really need to stop your thread each stitch to stop it being wasted all over the back of the design. Because I knew I had lots of white thread in my stash, I didn’t worry too much about it. I was so impressed with this kit I instantly signed up for a three month subscription. The theme for this month was Winter animals. I was excited to stitch some cute animal designs! I’d already seen the sneak peeks on the website so I knew one of the kits in this month’s box. This month, my favourite design isn’t actually the main kit. The main kit is the ‘too cool for you’ at the back, while my favourite is ‘I like chillin’ with you’. I’ll definitely be ordering the colours to complete that design soon! I’m only two months in but I really like these boxes. The kits all have great quality materials in them, with easy to follow instructions. The extra supplies are a really nice bonus too. Double checking the prices it’s not actually any cheaper to go for a three monthly thing instead of paying monthly. It’s only cheaper if you start signing up for 6 months at a time. I won’t be doing that just yet until I can be sure I won’t end up with a backlog of loads of kits to make! If you’re not sure about signing up to a box, you can also buy kits and PDF patterns from the Geeky Stitching Co shop. I’ve got my eye on some of the cute succulent and cacti kits!